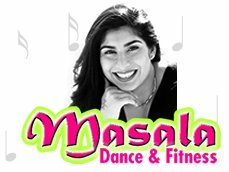 Popularly known as "Indian Jane Fonda," exercise teacher Sarina Jain has started a Bhangra based fitness program in New York called Masala Bhangra. The aim is make workouts more entertaining. Experts also say that incorporating music and dance into exercise routines can help people enjoy their workouts more - and stick with them. Sarina Jain tells her students to pretend they are dancing at her wedding. And as her class steps, claps and sweats to the pulsating sounds of Indian drumbeats, she encourages them to "Celebrate! Celebrate! Celebrate!" Masala Bhangra Workout CD & DVDs area also available at Barnes and Noble.